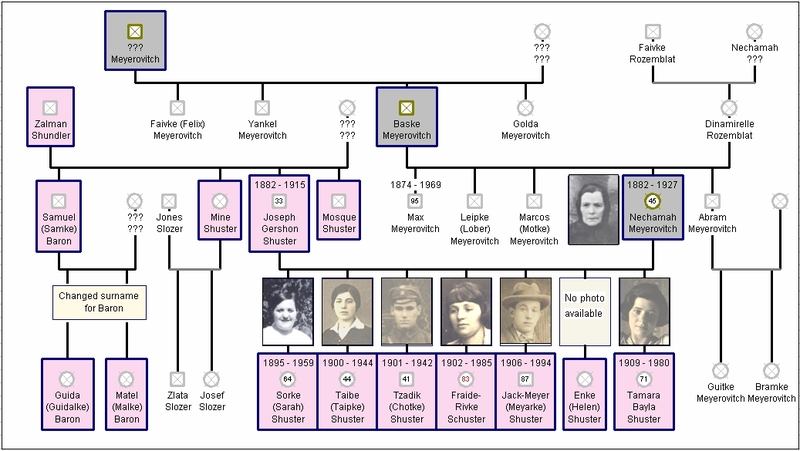 Shuster Meierov genealogical tree, click to enlarge. The only record we have about Zalman Shundler is that he was a big bearded man who lived about 100 years. I do not know if there were more siblings besides Samuel, Mine, Mosque and Joseph Gershon. Samuel migrated to Detroit, United States where he married and had 2 daughters. They changed their surname for Baron. Because his two children were women, if they married, their surname from then on, was the one of their husbands, this being the reason that makes it so difficult to trace them…..but not impossible!!! Mine married Jones Slozer and had two children: Zlata and Josef. No idea if they remained in Lithuania or migrated. There are no records on the whereabouts of Mosque. 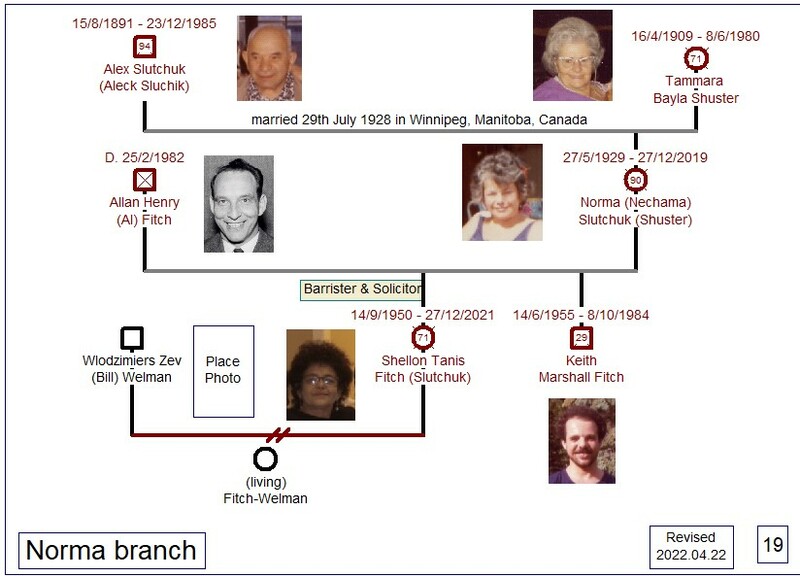 When Jack Meyer Shuster got married in Winnipeg he stated in his marriage certificate that his father (Joseph Gershon) was a merchant from Lita, Russia. 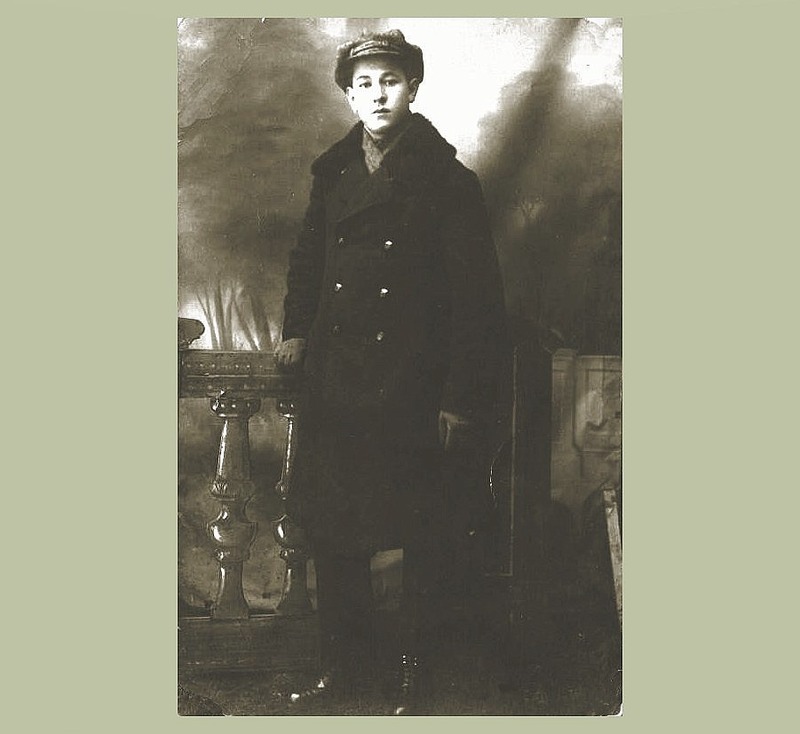 He died at an early age (about 33 years old) and on his death-bed asked his son Tzadik to take care of his mother and younger siblings (Sorke was already married and living in Canada) and gave him his gold watch as a gift. My grandmother said her second surname was "Meierov" and that's the spelling on her documents. 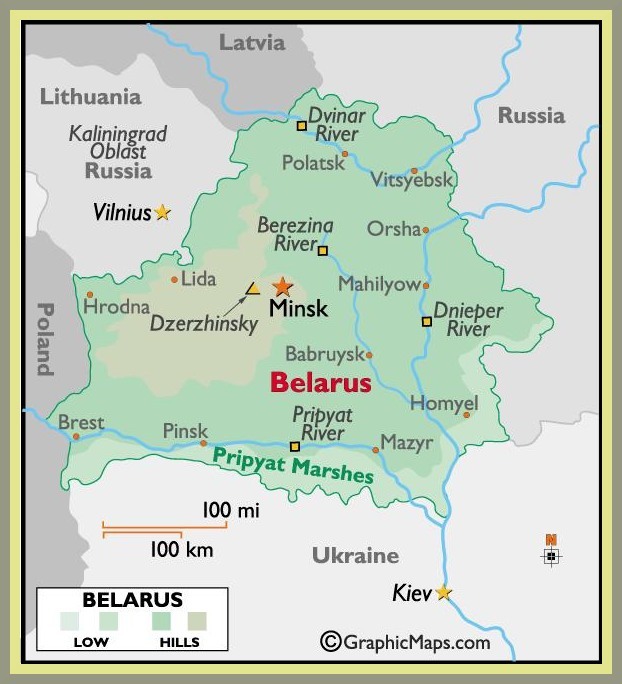 Belarus (formerly Belorussia), translated as White Russia. Most probably they were from Minks, now Belarus. Baske and Dinamirelle were millers and there is a story about them hiding gold coins in the flour casks. Dinamirelle's parents were Faivke Rozemblat and Nechamah. Dinamirelle passed away at 99 years old and Nechamah at 45 years old. 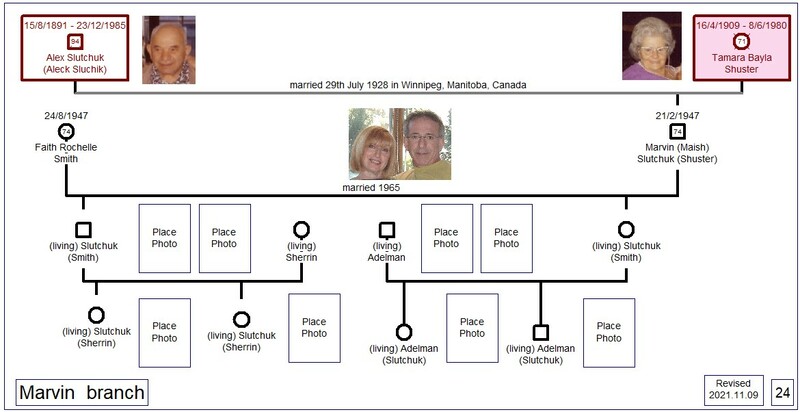 Sorke(Sarah), migrated to Canada, was married and her descendants nowadays live in Canada, in the United States and even in Thailand. Taube , husband and children died in the Holocaust, but for an only child, Bluma that migrated to Israel in 1971. 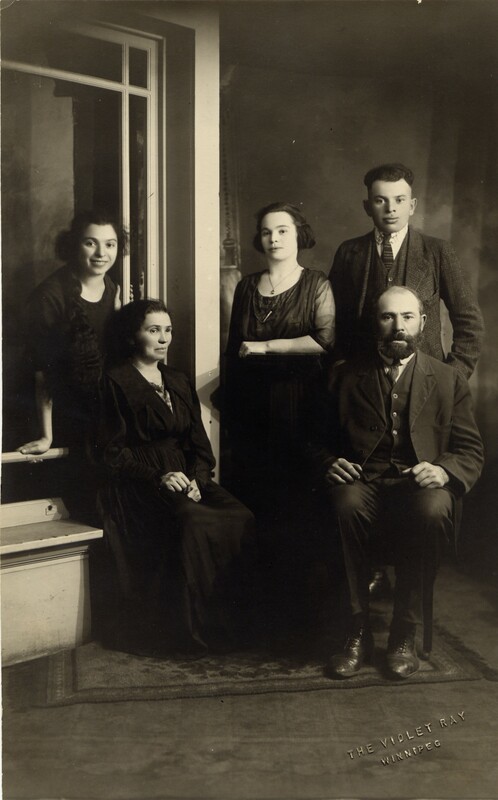 Tzadik, wife and children died in the Holocaust, but for an only son, Berkel that migrated to Israel in 1971. Fraide Rivkeh (Rebeca Rosa), migrated to South America, Uruguay and her descendants nowadays live in Uruguay and in the United States. I am a descendant of this branch. 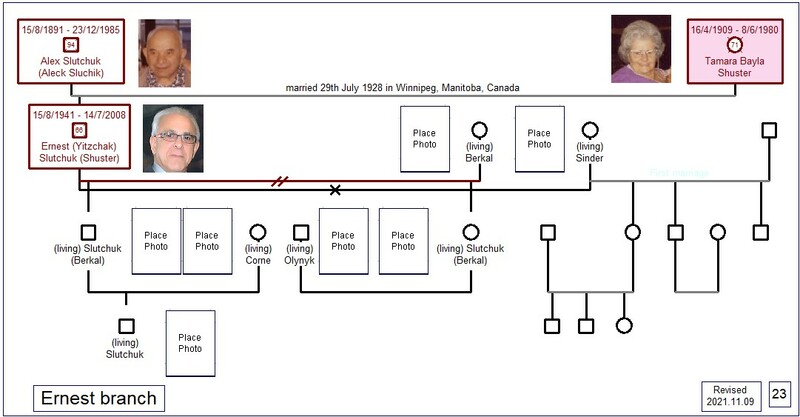 Meyarke (Jack-Meyer), migrated to Canada, was married and his descendants nowadays live in Canada and in the United States. Helen, died in Lithuania at an early age (about 16 years old) because of a wound inflicted by soldiers and also of hunger. 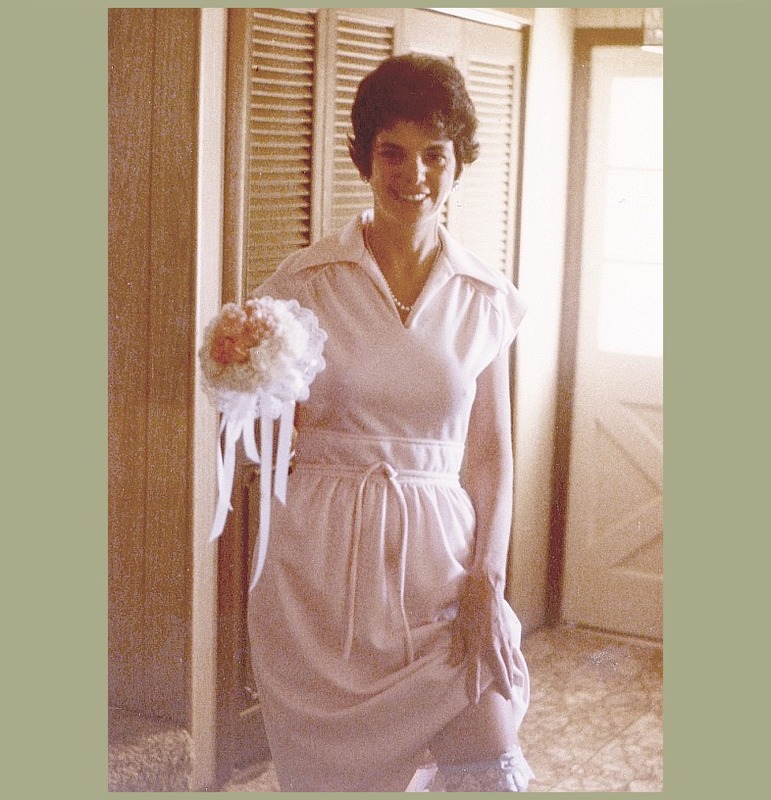 Tamara-Bayla, migrated to Canada, was married and her descendants nowadays live in Canada and in the United States. 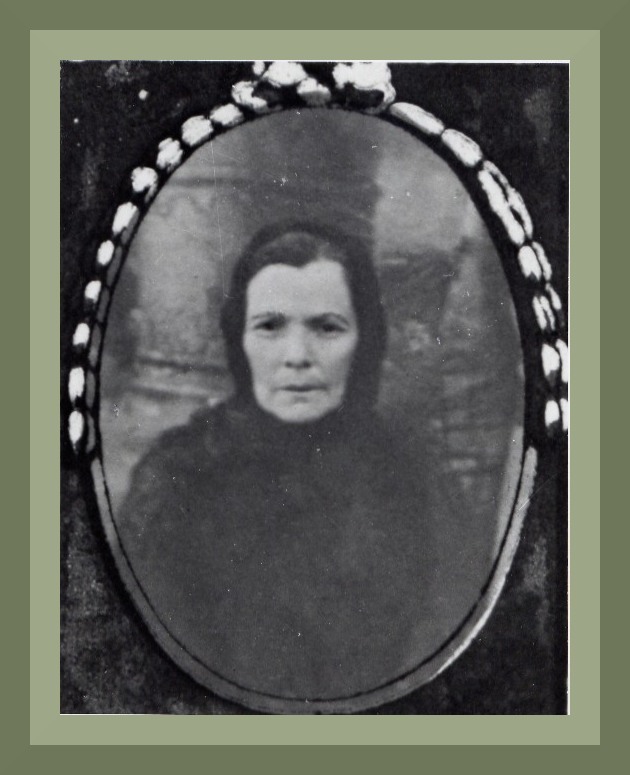 Sarah branch (Sorke), click to enlarge. Sarah was the first of seven siblings. She was born in 1895, in Lithuania, most probably in Kawarskas. 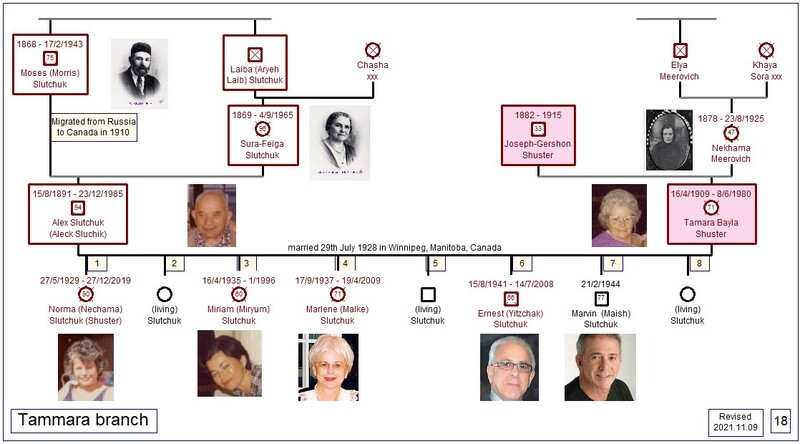 She was the first one to leave the family nest and migrate to Canada, before 1914, most probably summoned by her uncle Max Meirovitch, who was living in Winnipeg, Canada. She married Morris Amitin the 9th of August 1914. They had 3 children: Joseph Gary, born the 6th of July 1915; Samuel, born the 10th of June 1916 and Delia, born in 1922. 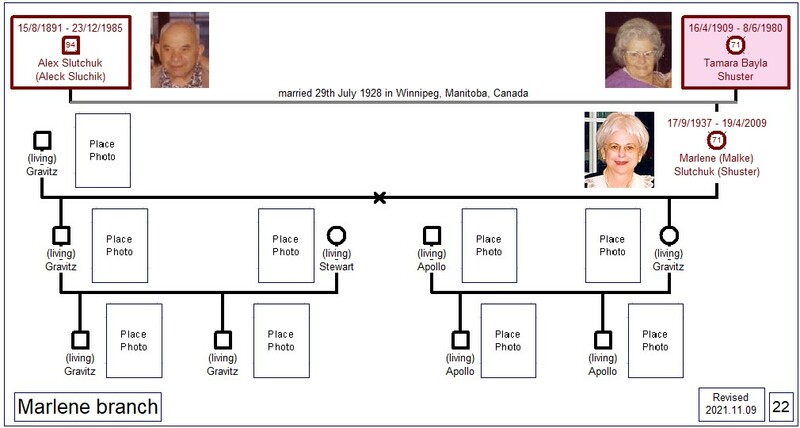 Delia was single: she passsed away in Winnipeg, Canada, and is buried at Rosh Pina Cemetery. Joseph Gary was named after his mother's side grandfather. He married Verna Polson in 1936. 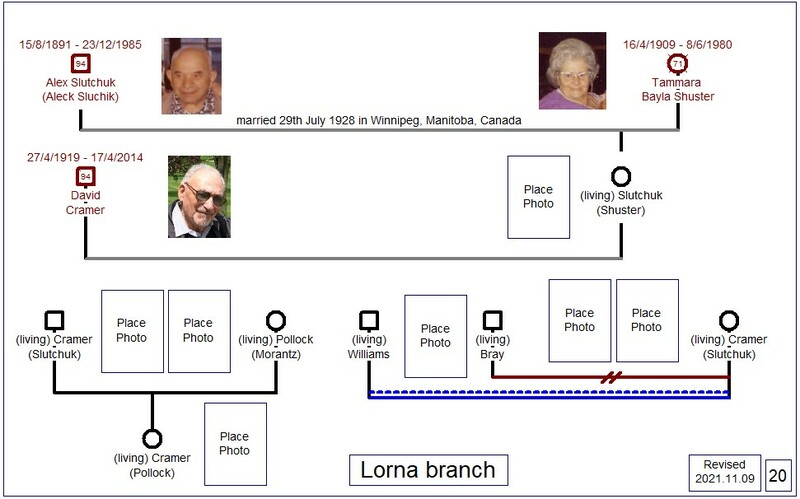 Verna was born the 5th of May 1911, in Winnipeg, Canada. They had 3 children: Cecil (Bill), the eldest was born the 31st of August 1939 and passed away the 28th of September 1984. The other two siblings are alive and have an extended family. Marriage information, click to enlarge. Leizeres and future brother-in-law Meyarke. Fraide Rivke was about 14 years old, when, with youngsters of the same age, were baking matzoth for Passover. Another youngster, barely her same age, took little bits of the dough and started to throw them at her. That was the day the romance started!!!!!!! Leizeres knew the glazier trade as his stepfather Sroel, taught him, and also was chief of fire brigade. As it happened in those days, Rosa was illiterate, but Leizeres was educated and spoke quite a few languages: Lithuanian, Russian, Yddish, Polish and later on in Cuba, Spanish and some English. According to the Lithuanian Embassy, around 1930, Leizeres volunteered (The Ketubah says 1914). Marriage certificates had been requested from Lithuania but have not yet been found. According to Cousin Enrique, his father Sasha told him that when he was a boy, he sung in his brother Leizeres' wedding at the Synagogue. They had nine children. Dora Golde was the eldest. Then came twins that were born circa 1918 (a boy and a girl) that died from pneumonia when they were about 7 months old, Ricardo, Nelly and Miguel who were born in Lithuania. When Miguel was a baby (he was born February 1926), the family with 4 kids migrated to Cuba. No records had been found yet as the exact date, their port of departure, the ship they traveled in and when they arrived in Havana, Cuba. Mirel and Josek were born in Cuba. Henke was born in Uruguay. 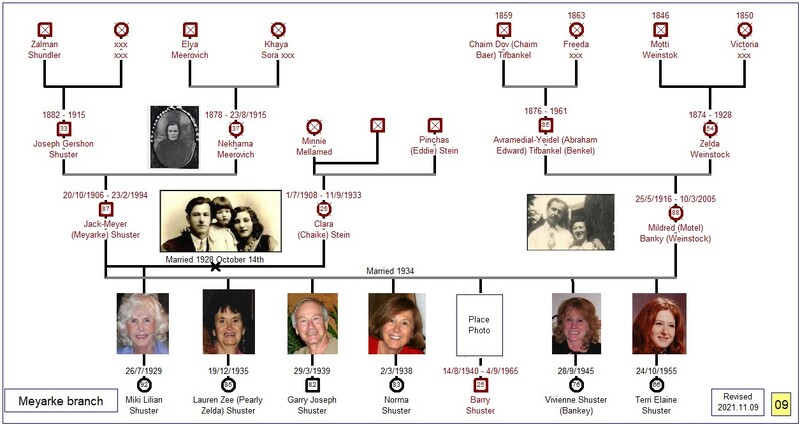 Meyarke Shuster was the 5th of seven siblings. He was born in Kawarskas, Ukmergé the 20th of October 1906. He arrived to Halifax, Canada in the spring of 1921 or 1922. From there, he took the train to Winnipeg with no money for food and the conductor took pity on him and gave him job as a porter. This was documented (June 30th 1980) along with wonderful stories about his childhood, in a home-made movie. Thanks to his grandson, I do have the movie in DVD and could listen first hand the stories Jack told. On arriving, he changed his first name to Jack Meyer. 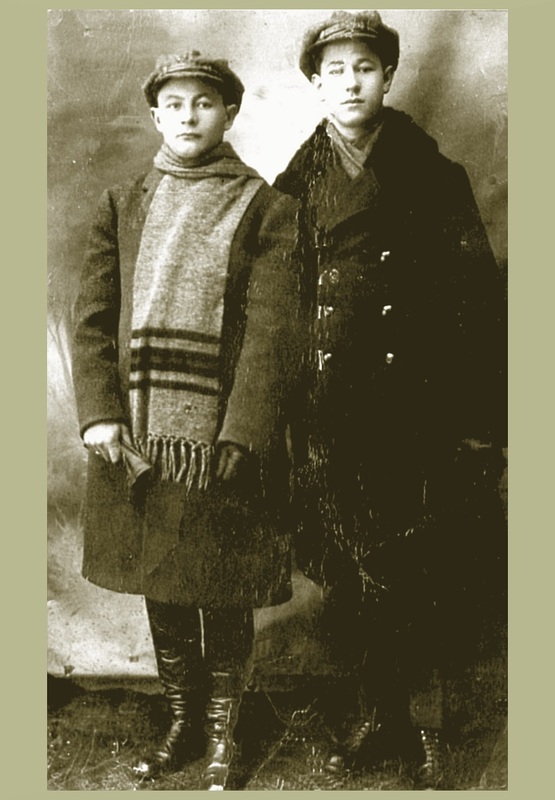 In Winnipeg, his older sister, Sarah (already married and with two sons: Joseph Gary and Samuel) was waiting for him. He started to work and paid back his sister, the money she lent him for his passport, traveling ticket and expenses. In October 24 1928, he married Clara Stein. He was working as a cloak operator and living in Winnipeg. His first child was born a year later. His wife Clara passed away in September 11th 1933. Jack Meyer branch (Meyarke), click to enlarge. Note: Awaiting permission to display data and pictures. First marriage and first child Miki, click to enlarge. As a widower, in 1934 he married Mildred Banky and they have 6 more children. On may 1945, when Mildred was pregnant of the sixth child, the family moved to Toronto. In the year 1969, Jack, Mildred and the seventh child, that was 14 years old, moved to Northridge, California. He passed away the 24th of February 1994 in Northridge, Los Angeles. His wife Mildred moved to Phoenix, Arizona in the 2000 and passed away March 10th 2005. Second child, click to enlarge. Third child, click to enlarge. Fourth child, click to enlarge. Fifth, sixth and seventh children, click to enlarge. 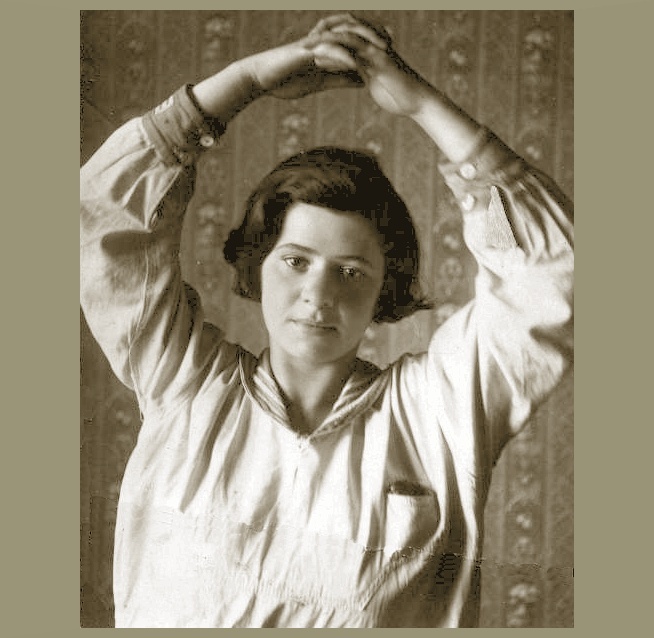 The youngest of seven siblings, Tamara was born in Lithuania the 16th of April 1909. Around 1927 she was the only child still living with her mother Nechamah. 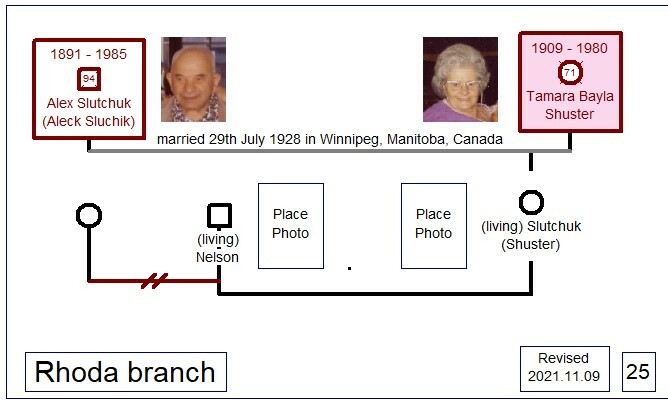 When Nechamah passed away, she migrated to Winnipeg, Canada, where her older siblings Sarah and Jack Meyer where already living. Tamara married Alex in Winnipeg, Manitoba,the 29th of July 1929. 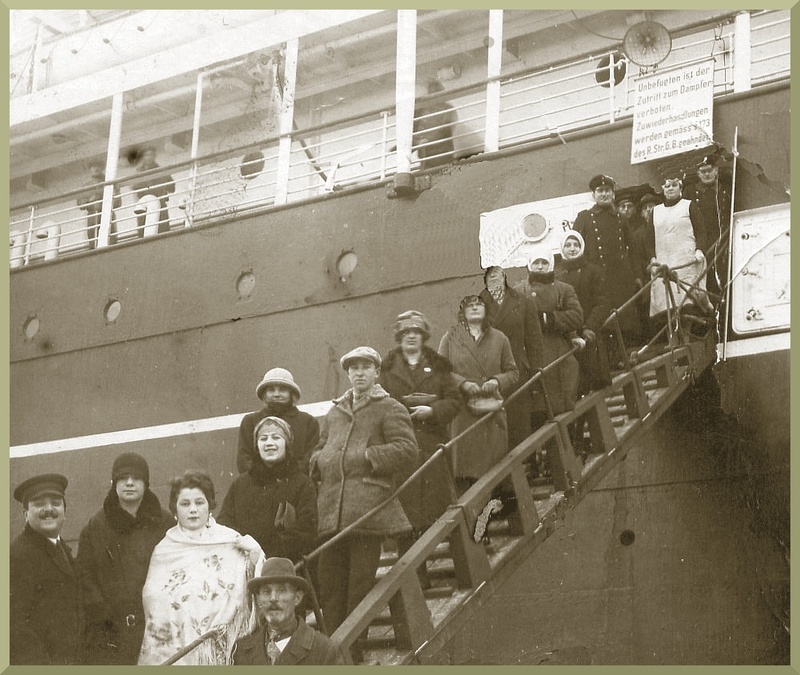 Tamara Bayla arriving to America, circa 1928. She married Alex Slutchuk and had eight children. She passed away July 9th 1980. The eldest of three siblings, Alex was born August 15th 1891, at the village of Mickasavitch, in the province of Minska, in the Empire of Russia. He arrived in Canada,Winnipeg in August, 1911. Alex passed away, the 23rd of December 1985. Tamara branch, click to enlarge. Note: Awaiting permission to display data and pictures of other siblings. First child, click to enlarge. 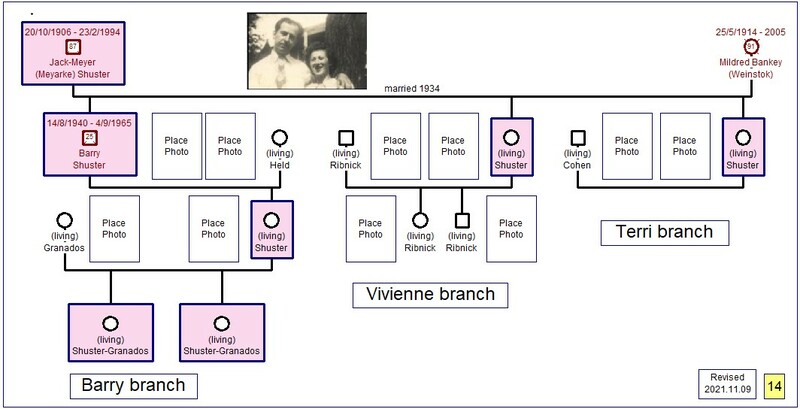 The third of eight siblings, Miriam (Hebrew name Miryum) was born in Canada, Winnipeg, the 16th of April, 1935. She married Charles Brandon and had no children. They lived in California. Miriam died in January 1996. Her husband Charles pre-deceased her. Note: The fifth child of Tamara branch does not want to be included in the family tree nor have any data of his family displayed. Sixth child, click to enlarge. Seventh child, click to enlarge. Note: Marvin and his wife had authorized to had their data and pictures put in. Awaiting permission to display data and pictures of children and grandchildren. Eighth child, click to enlarge.